Watford beat Arsenal 2–1 in the FA Cup sixth round, ending the Gunners’ run of 15 consecutive victories in the tournament, which has brought their only trophies in the last two seasons. The image above depicts the scene when Danny Welbeck missed a late chance to equalize. 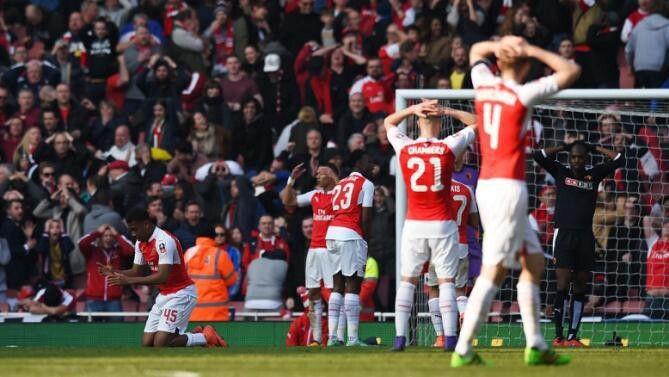 The visible agony felt by every Arsenal player and fan in that picture, plus the sheer disbelief of the Watford player sums up the last decade or so of Arsenal Football Club rather neatly. Their next match is against Barcelona, whom they trail by two away goals going into the second leg of their Champions League round of 16 tie. They currently sit eight points behind Leicester City and six points behind local rivals Spurs in the Premier League table.